Westcoast Wool & Livestock is continuing its strong growth, recently expanding its livestock services to the Northern Territory under the new brand, Westcoast Northern Livestock. The company has appointed former WA producer, Scott Witham, to service the region. Scott and his family run a beef breeding and trading operation as well as a flourishing tourism enterprise based on the original ‘Mt Bundy’ station property near Adelaide River, 100 kilometres south of Darwin. Livestock Manager Gerald Wetherall said the NT presented an exciting opportunity for the company and it was targeting improved service and increased competition for producers throughout the region. Gerald said despite the disappointing wet season in the region to date, the recent free trade agreement with Indonesia would help buoy live cattle exports to the country, in addition to smaller markets in Malaysia and Vietnam. “It will certainly be a confidence boost for exports to Indonesia now and in the longer term,’’ Gerald said. He said there was renewed activity around local processing, including of buffalo, while Westcoast Northern Livestock also would support producers with trading and finance to assist production opportunities. The business will also leverage the company’s long-term relationships with exporters and processors, as well as its WA and national network links. Gerald said Scott had excellent knowledge from a lifetime with livestock, an already strong network across the local community and was further supported by his daughter, Bec, and her partner, Steve, who also work at a nearby live export depot. Originally from a mixed family farm near Broomehill that also was home to Coorynup Hereford Stud, Scott later ran his own mixed farm including Hereford/Simmental cattle with his wife, Sue, before a burning pastoral passion led them to ‘Mt Bundy’ station 11 years ago. In addition to 100 hectares at the main station, the family leases another 8010ha, running about 200 Brahman breeders and trading 500-700 Brahman cross cattle annually. The main property comprises tourist accommodation and facilities, including a caravan park, glamour tents, eco tents and a further 59 beds in different types of accommodation, all of which is primarily managed by Sue and also employs their youngest daughter, Kasey. 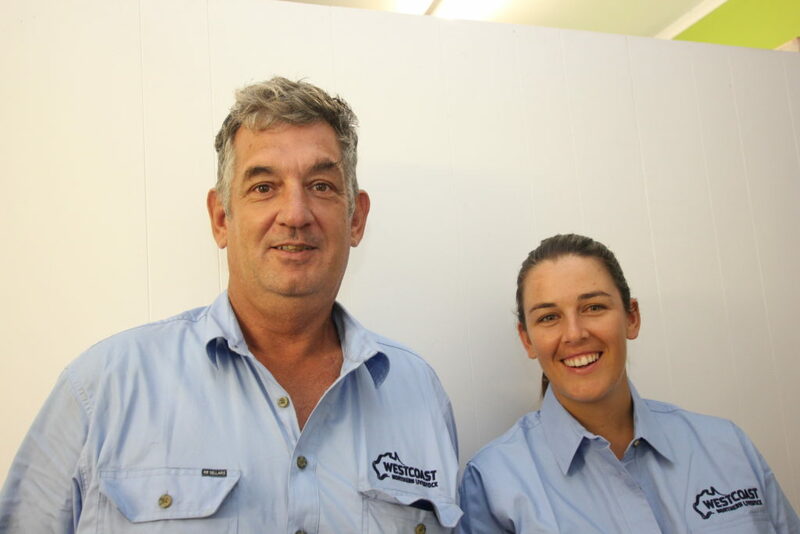 Former WA producer Scott Witham and daughter Bec, Adelaide River, are looking forward to extending Westcoast’s livestock services and support throughout the Northern Territory under the new brand, Westcoast Northern Livestock. Scott has quickly embraced the new role with Westcoast Northern Livestock. He said the Westcoast Wool & Livestock management team was very impressive and he was excited to join its growing network of agents. Scott already has sold a number of lines of cattle, including for live export. He said the trade tariff to the Indonesian market amounted to 5 per cent, so the free trade agreement would be a welcome benefit for the industry. A new local abattoir at Batchelor, just north of Adelaide River, also will offer options for bulls and older cows as well as buffalo and donkeys, which are more prevalent near Katherine. From a convenient central base, Scott said he was looking forward to improving service and support to producers large and small, keeping them more informed and helping find different markets to ensure they maximised their returns. He said he aimed to better assist smaller producers with their marketing options and production, including helping to increase their stock numbers. Bec also provides invaluable support, stemming from her work at the live export depot, with targeting key weights and finishing cattle. With no monsoons experienced during the wet season so far, Scott said many areas had recorded only half or less of the normal average season rainfall. Consequently, many cattle have been or are soon to be moved or traded, there are enquiries for agistment and weaning is occurring earlier to help cows recover.